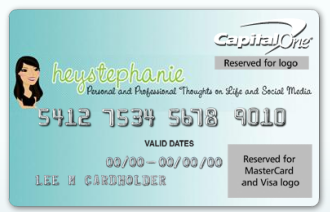 I stumbled across Kristen Nicole’s article on Mashable titled, “Use Flickr for Custom Capital One Cards” and thought it was a great campaign for several personal reasons. First, Capital One makes it simple to create a personalized credit card. I already have a Capital One card but now I can select a photo that’s already hosted on my Flickr account or simply upload a jpeg from my PC and make it more fun. See upload guidelines here. Second, by using a personal photo I’m creating an emotional attachment with my credit card. When I’m in the middle of a transaction, do I whip out my boring debit card or use my fancy customized Capital One card? Chances are, I’m going to whip out the Capital One card then chat with the clerk on how fun it was customizing my credit card and tell her where she can go online to create her own! It would have also been interesting to see what would happen if the Capital One Image Card promotion ran a user-generated contest around the campaign. 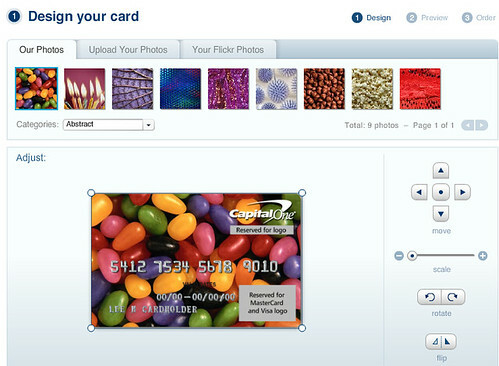 Let people create their custom Capital One card with their favorite photo then offer a prize (i.e. a $150 Capital One Gas Card) for the best design in a photo category (i.e. Family, Best Friends, Graduation, etc.). People can engage longer with the promotion and check out what other people have designed and leave comments if they want to. And if they’re not interested in other people’s creations, they can still order their new card. That’s a great way of building brand awareness in my opinion, what do you think? Create your own personalized Capital One credit card now. Thanks Tim for dropping by! It’s always great to meet a new reader. Btw, I checked out your blog and learned a great deal! Thought you might want a heads up so it doesn’t happen to you. And I just found your blog through Brazen Careerist forum, I really enjoy it, nice work! Thanks for the heads up Jessica! I’ll definitely watch out for that. Btw, you’re post on Unplugging got me interested in 52 Nights Unplugged. I might just have to post about that this week.